This is the first of a series of posts detailing mine and my sister’s trip to New Zealand’s North Island. View all the posts so far here. Most tourists go to New Zealand for its staggeringly beautiful scenery, geothermal wonders and outdoor pursuits, and I was no different. I had only two weeks to see the North Island and didn’t want to spend a second longer than necessary surrounded by buildings. 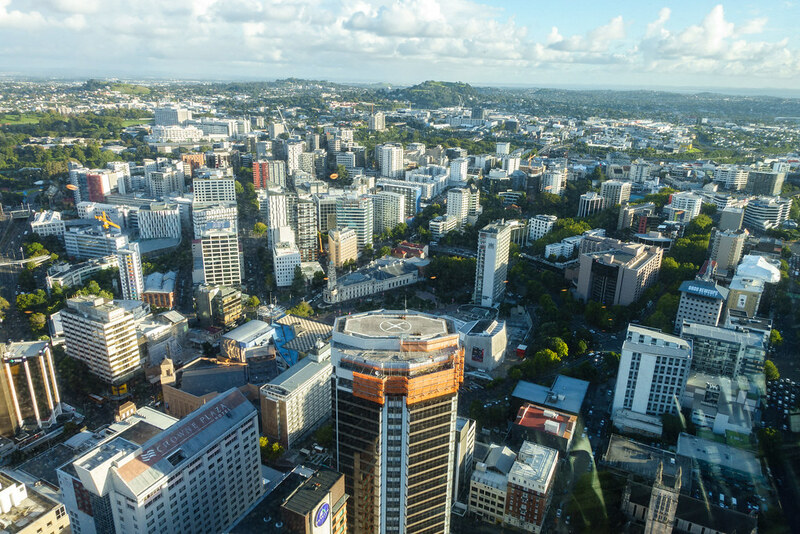 I limited my time in Auckland – the country’s largest urban area – to several hours, after and before my flights. But I tried to use this brief time as well as I could. As you’d expect after roughly 24 hours of flying, my sister Tama and I arrived in Auckland tired and grouchy. Our moods weren’t at all improved when, having taken the Sky Bus from the airport (NZ$18 one way) and checked into Queen Street Backpackers, we had to request a different room because the window in ours didn’t lock. 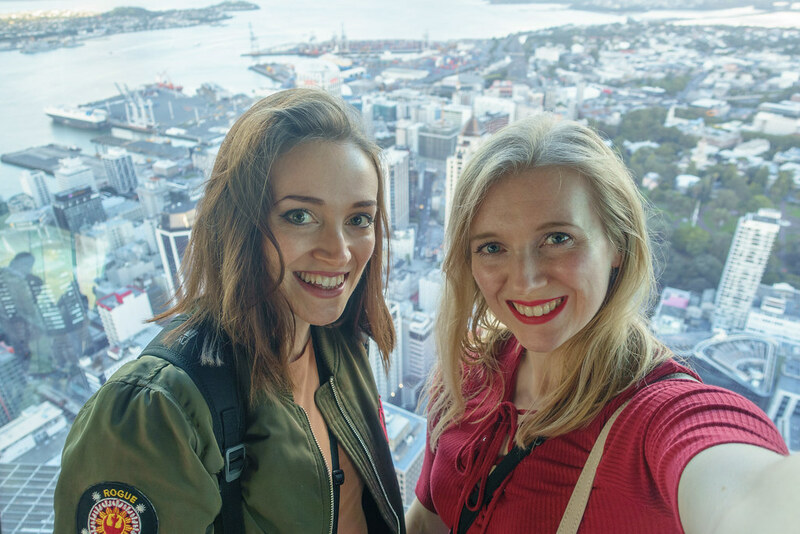 Despite lacking in motivation, we felt we couldn’t miss the opportunity to see Auckland’s main tourist attraction: the Sky Tower. It doesn’t take a genius to see that going to either of the restaurants is a better deal than paying solely for entry to the viewing platform, seeing as that way you get food and/or drink for your money in addition to access to the viewing platform. But, tired and grouchy as we were, we weren’t willing to wait several hours for a spot at Sugar Club so had no choice but to buy standard entry tickets. 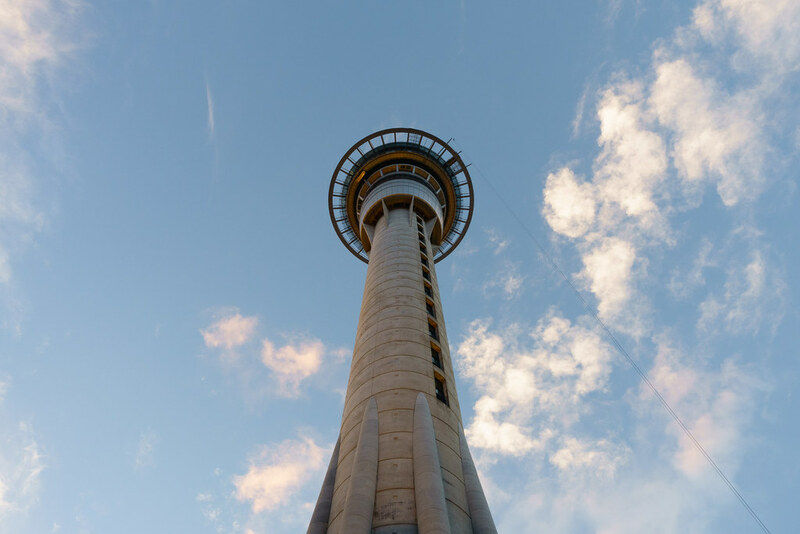 So take my advice: if you’re going to Auckland, and want to go up Sky Tower, book a table at one of the restaurants well in advance! 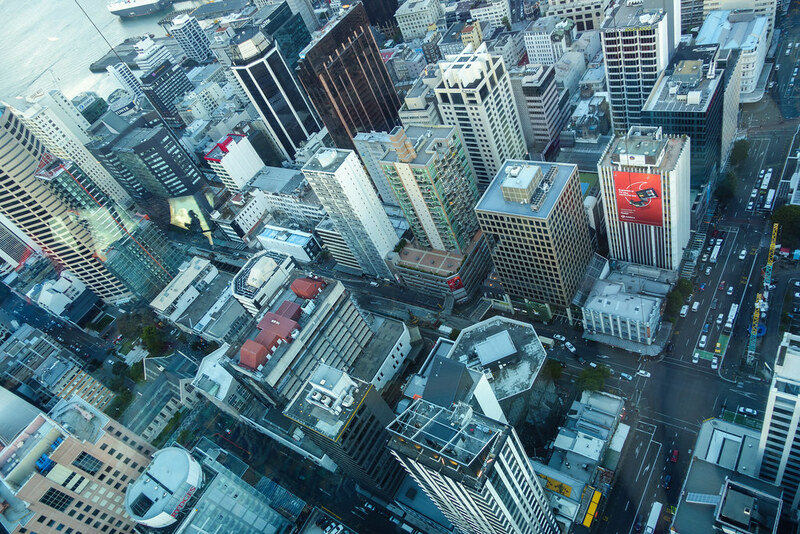 Nevertheless, I felt that going up the Sky Tower was worthwhile. The 360-degree view you get is amazing, especially as the slanted windows allow you to look down on a forest of skyscrapers. 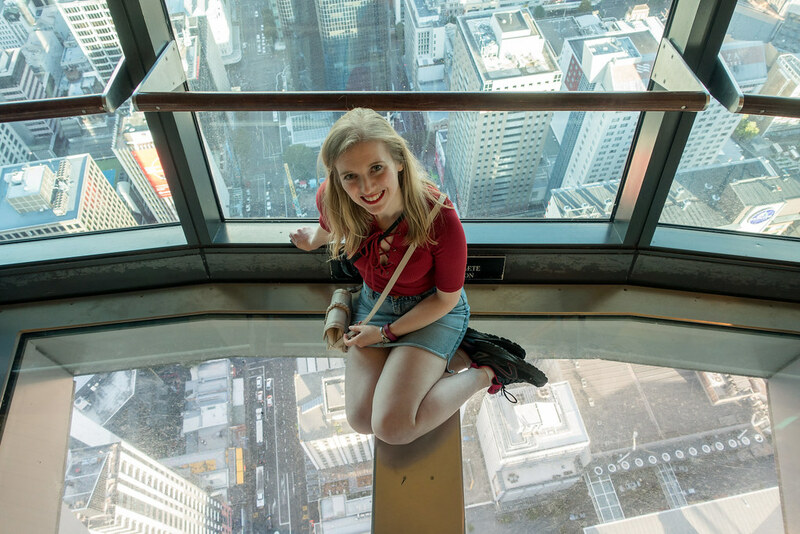 It feels surreal to look down at your feet as you’re standing on the glass floor panels – and not advisable if you suffer from vertigo! Back on solid ground, we struggled to decide where to eat dinner. Federal Street, beside Sky Tower, holds a long line of nice-looking and buzzy restaurants. 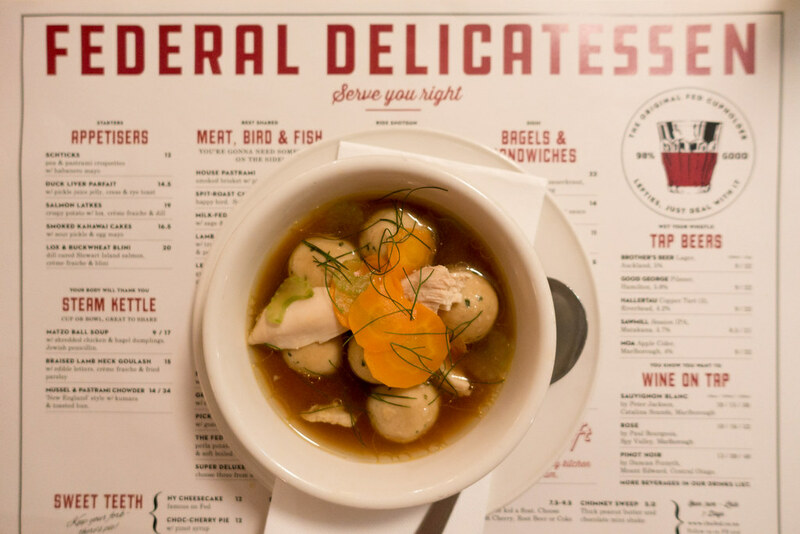 As we were feeling delicate we decided on the quietest on the lot, Federal Delicatessen, which is modelled on a New-York Jewish deli with vintage-attired waitresses. The retro-styled menu offers loads of tempting and slightly unusual options, but I decided on a simple Matzo ball soup while Tama had ‘Schticks’ (pea and pastrami croquettes) with a grilled carrot salad. Almost two weeks later I was back in Auckland, but this time by myself. I’d left Tama in Taupo to start her year abroad, while I went to catch my flight back to the UK. It took another long journey to get there – this time a five-hour intercity bus ride. Upon reaching Auckland I stowed my rolling luggage in a locker at the bus station, before walking into town. I planned to watch a film at Academy Cinema later, and all I really wanted to do before then was find somewhere to relax. Just a minute’s walk from the cinema I found what is surely the nicest place to have a quiet cuppa in the city. The Mojo Cafe at Auckland Art Gallery offers posh loose leaf tea in large pots, free water to which you can help yourself, and a lovely shaded balcony to enjoy them on. It was the perfect place to rest and read my book, sheltered from both the crowds and the burning sun. Through prior online research I’d found that the independent Academy Cinema would be showing Loving Vincent, which I’d wanted to see since its release but had failed to find in any cinemas back home. I got my ticket for $14, followed by a glass of rose wine and a small box of popcorn for $12, which I thought was good value (certainly much cheaper than at a UK multiplex). I loved the film, and watching it in Academy Cinema’s small and intimate, 16-seat ’boutique’ theatre made it feel all the more special. The film finished at 19:40, giving me just enough time to retrieve my bag from the bus station before the 20:00 cut off. I got the Sky Bus back to the airport. 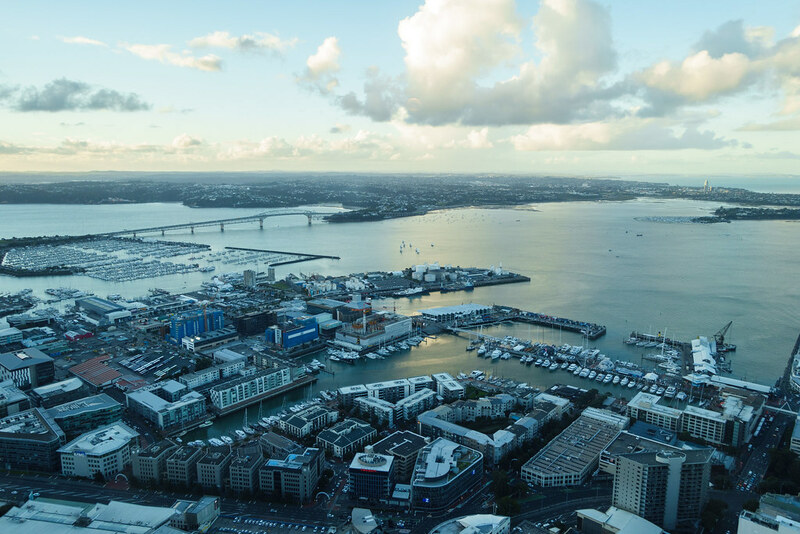 Auckland wasn’t a bad place to spend a few hours, but the fun truly began when we left the urban sprawl and got out into New Zealand’s glorious nature: its rugged cliffs, glow-worm caves, bird-filled rainforests, white-water rivers, rolling green hills and spectacular volcanic valleys. Keep reading to follow my journey around New Zealand’s amazing North Island. Posted in New Zealand, Reviews, TravelTagged Academy Cinema, Auckland, Federal Delicatessen, Sky TowerBookmark the permalink.